Margaret Holloway is involved in the worst pileup in London’s history. Crammed into her crunched vehicle, which is on fire, she fears she will die when the gas tank explodes. There are only minutes to spare and she cannot escape. Just as she starts to accept her fate, a man appears. He shatters the car’s glass and pulls her from the wreckage. Margaret catches her breath, relieved to be alive, and discovers her savior has fled the scene. What unfolds in the days following the wreck is an unpacking of a childhood trauma Margaret had forgotten. 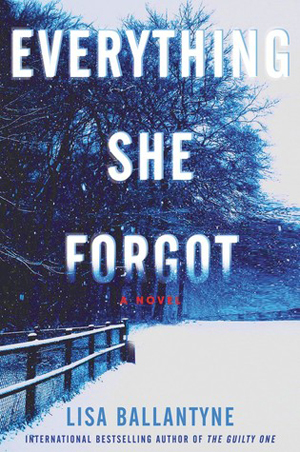 Stuffed away in the depths of her memory bank, she had forgotten that she was once abducted. Everything She Forgot tells a multi-layered story through the eyes of four primary characters. Part 1985, part 2013, Margaret pieces together the truth of what happened to her when she was a young girl. The novel is presented as a mystery, and indeed it is, as far as Margaret is concerned, but the archetypes are fairly blatant. It doesn’t take a sleuth to figure out who the savior is. Though I’d sorted out the ending at the halfway mark, I still enjoyed reading how it all came together. I enjoyed the diverse characters, including the terrible ones, and felt a certain peace when the narrative concluded. Buy Everything She Forgot here.